"Molly" lives in Sydney and is owned and loved by Lyn & Jan Shaddock. Molly was supposed to be a pet dog who we saw on occasional visits but much to our delight Lyn and Molly discovered the Agility rings and she is a star. 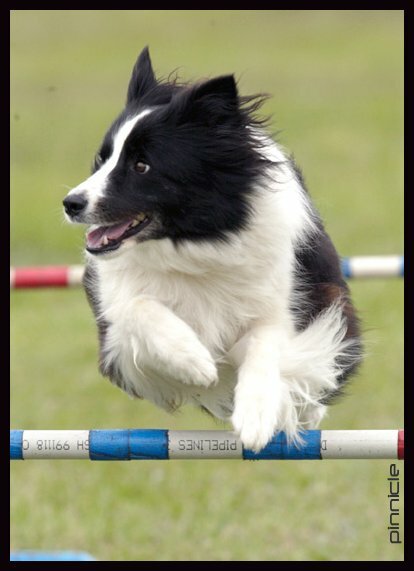 Molly has won the Novice agility ring at Sydney Royal and completed clear runs in both agility and jumping at the Border Collie National. Molly carries on the great success of Shiva's first litter with her litter mates Webster and Buffy enjoying tremendous success in the breed rings. With an amazing array of titles to her name, Molly continues to do us proud and we wish her and Lyn success in whatever else they do.